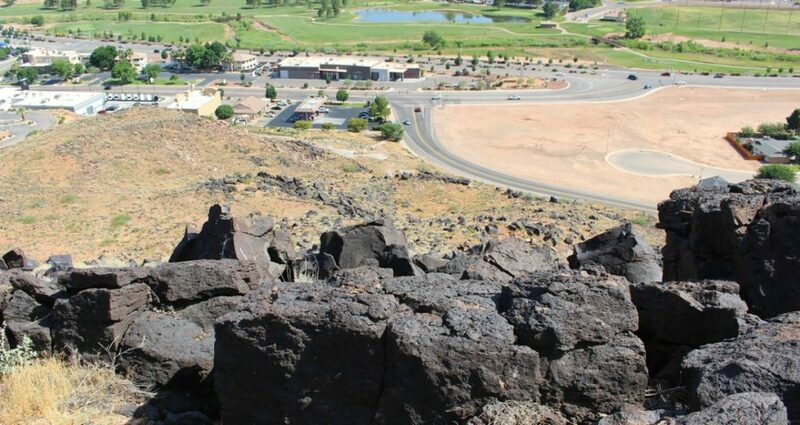 ST. GEORGE — A man was rescued after a customer at a nearby gas station heard calls for help coming from hundreds of yards away on the Black Hill Saturday afternoon. 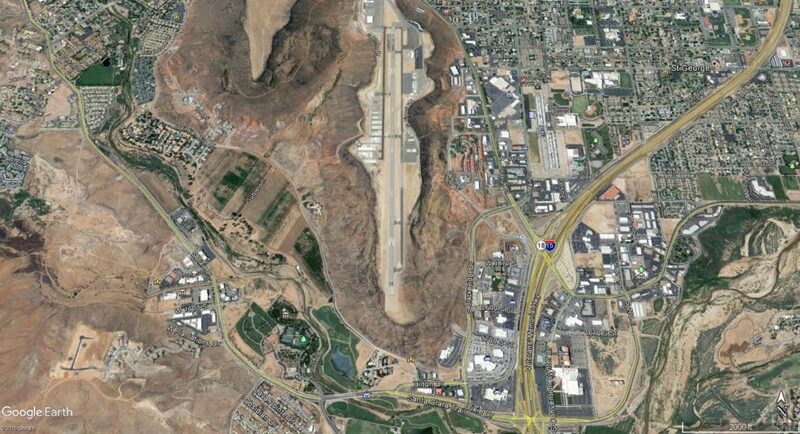 Shortly after 3:30 p.m. officers and emergency personnel were dispatched to the south side of the Black Hill, past the end of the runway located at the old St. George Municipal Airport. A customer shopping at Maverik on Hilton Drive thought he heard someone yelling for help from the direction of the hill, St. George Police Lt. Joseph Hartman said. 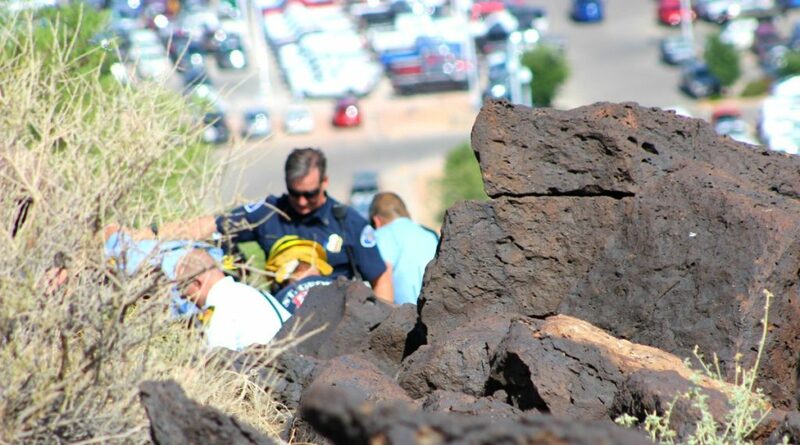 Using high-powered binoculars, the customer began to scan the side of the mountain and was able to see someone situated in the middle of the lava rocks and called 911. 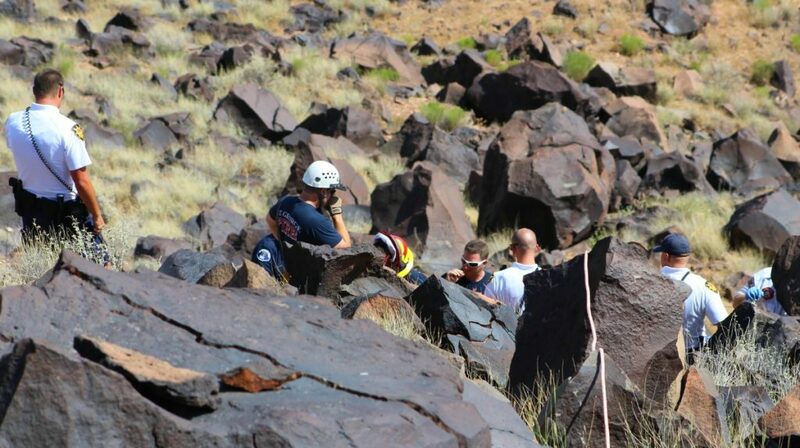 Resoponders from St. George Fire Department and Gold Cross Ambulance were called in to assist in the rescue of the man. Upon arrival firefighters dropped ropes down the side of the hill to where the man was being assisted by police and bicycle patrol officers. 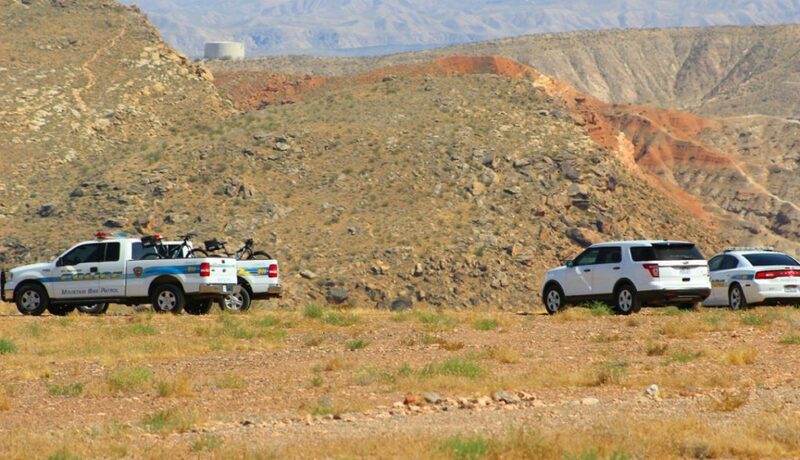 The man told officers he was unable to continue hiking because of exhaustion and that he had remained stranded in the area for five days. Firefighters and paramedics made their way down, and once they reached the man, he was given IV fluids due to severe dehydration and exposure before he was carried to the top of the hill in a Stokes basket and loaded into a waiting ambulance. The man was then transported to Dixie Regional Medical Center for evaluation and treatment. 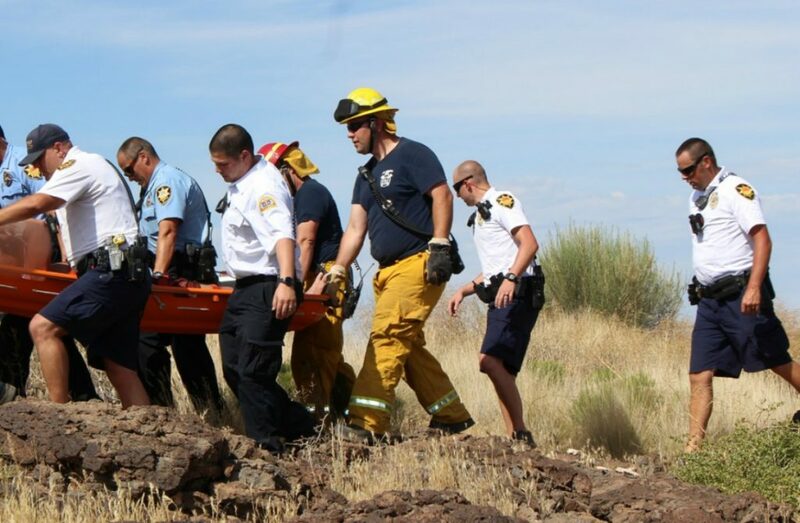 The man needed IV fluids immediately due to severe dehydration, Hartman said, and one of the Gold Cross paramedics made their way down the difficult terrain hauling a pack of medical supplies. “That’s not uncommon for us, these paramedics will typically get right in there and help us,” Hartman said. 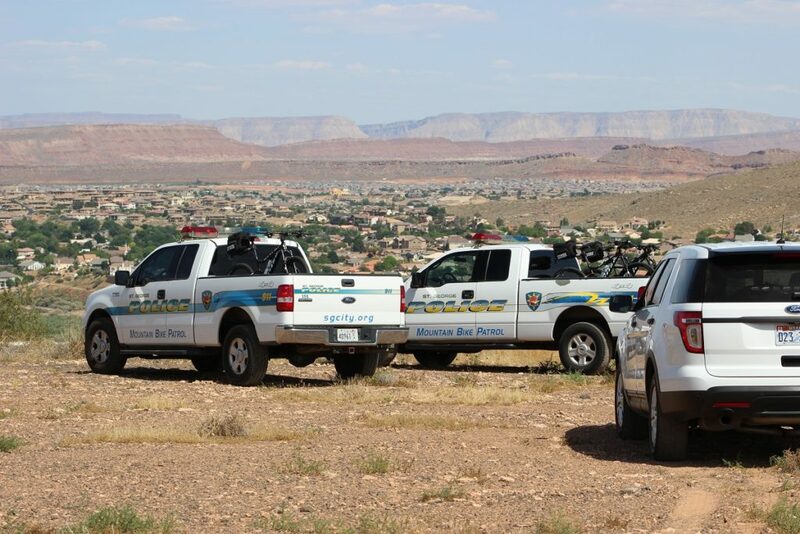 Officers from the St. George Police Department, including bicycle patrol officers, the St. George Fire Department and Gold Cross Ambulance responded and assisted in the rescue. This report is based on statements from law enforcement or other emergency responders and may not contain the full scope of findings. Why would anybody climb that area, with no water, alone. , phone??? People have to make better choices when they want to explore the outdoors. I agree also if he was that close to the Maverick why did it take that many days for him to yell for help? Something is missing in this story, namely the truth. The story leaves nothing but questions for me. WTF was he doing up there in the first place? Why couldn’t he get down? How old is he? I call BS on the 5 days w/o water; and anyone who was in town last week would too! Alien abduction could fit all the pieces together, but why wasn’t a missing persons report filed? I must say Miss Cody Blowers; short of LEO’s “stonewalling” you on the facts, I’d say you need to hire a new crime reporter (like me) to hand your caseload off to. 5 days, huh? I bet not. He was probably delirious from the dehydration and didn’t know up from down. My guess would be overnight at most. Keep in mind you can actually die from dehydration or hyperthermia in a matter of hours with this heat. One should recognize how important it is to know one’s capabilities before overruling one’s wishful thinking. There is a great trail up in that area, he may have wandered from in. Who is to say he didn’t have water or a phone? It says he became exhausted, so I would figure that he found some shade and rested to wake up to a dead battery on his phone. Why he didn’t hike out after his supposed short break is beyond me, maybe he was having medical issues. His water probably ran out up to the point it got him through this ordeal ( God works miracles every second!). Lastly, his cry for help finally was heard by a citizen who was paying attention to their surroundings instead of just their own thoughts. All just my own analogy though ;-). Glad another miracle was provided for this man, he is very lucky to be alive. I can answer all of these questions in a single word “Drugs”. Short of alien abduction it is the only thing that makes any sense whatsoever. A wandering crackhead? Haha, that’s not a bad bet. High on meth and wandering around in the heat up there. We may never know. Well I am going to blame Summit Gym and that darn rock….GO FALCONS! Great job for being concerned and taking the time to help this person! It’s not ignorance Cody. It’s just a well established, scientifically tested, statistical probability. Regardless, you went out of your way to help someone when others would not. Well done! 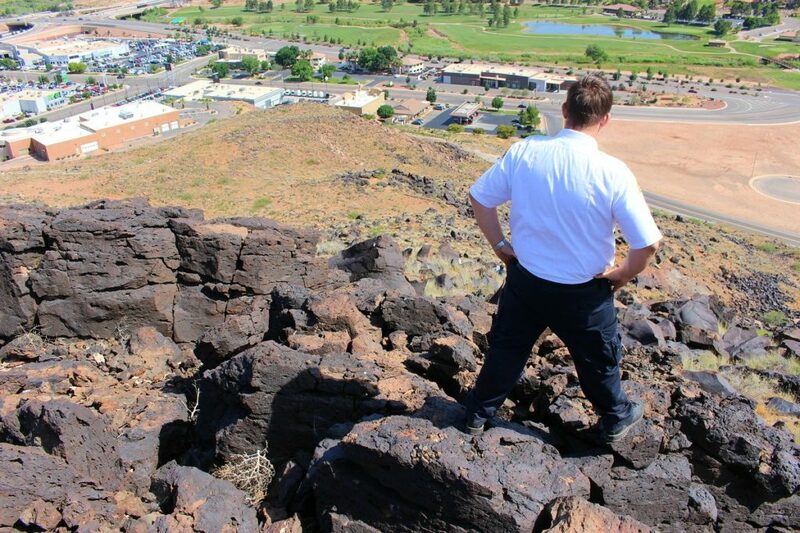 I’m sorry, but the mental image of some methed out tweeker addict wandering around on top of the black hill in 100 degree heat, completely out-of-it, methed out of his mind and hallucinating and muttering to himself just is too funny. The reality is, it was probably an older fellow who overestimated his ability to exert himself in this heat and got himself into some real trouble. He should be thankful to be alive. If you’re not very fit and not acclimatized to it it is actually not healthy for your body and not a good idea in general to exercise or exert yourself in this heat. This is my sister’s ex husband. The pain she and her daughter are going thru is real. Your guy’s comments are vile and disgusting. You are making jokes and laughing? I hope Karma comes for you big time. We are in pain and you crack jokes. Evil sob. Amazing how people will sign up for an account just to whine and name call and try to put others down. If we had the full story no one would’ve been speculating in the first place, but rather than come here and give us the story you just come and try to put others down and make threats. Might wanna check ur own karma, buddy. take care.